THE LIFESPAN OF a typical Berndnaut Smilde sculpture is 10 seconds—just long enough to be photographed. 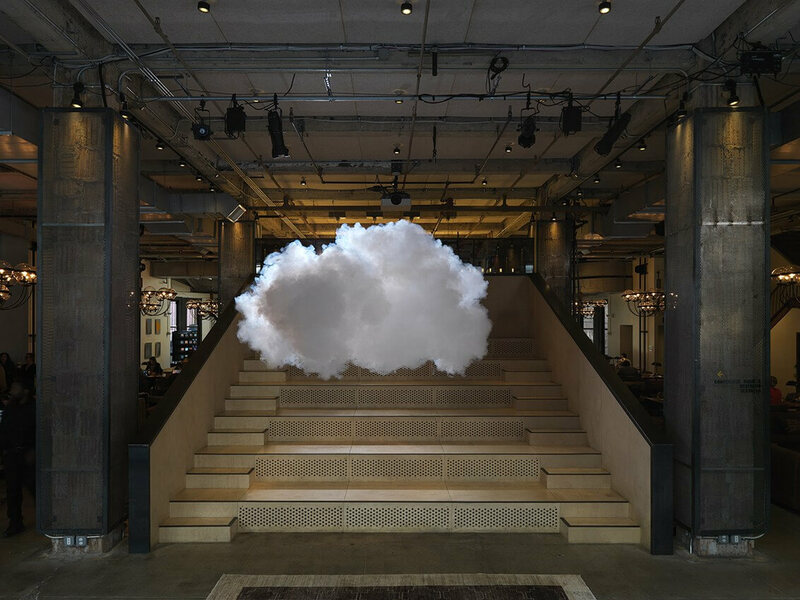 And his sculptures are as unusual as they are ethereal: Smilde makes perfect miniature clouds in a diverse array of indoor locations, from coal mines to cathedrals. He’s been at for several years now and calls the ever-expanding series Nimbus. Last month, he brought his weather wizardry to Frieze New York. There Smilde allowed onlookers to sit in on two days of his work inside NeueHouse, an upscale co-working space. His materials are little more than smoke and water vapor, and the results vary with the size and temperature of the location. The space must be cold and damp, with no air circulation. Smilde creates a wall of water vapor with the type of spritzer you might use on houseplants. A smoke machine then sends a puff of faux fog on a collision course. He likes to keep the clouds no bigger than six feet so they don’t fall apart too quickly. “I really like my clouds concentrated, with a lot of texture,” he says. The artist tinkers with the formula for a few days until he’s created what he believes to be the ideal cloud. For one shoot, he might create 100 clouds to get the image. The result is stunning, an ephemeral artwork caught just before it vanishes. The bare, often austere locations heighten the drama. While Smilde makes his clouds, he has a photographer right there to capture the moment. He prefers to work with photographers with experience shooting architecture, so the wood, metal and other elements are in sharp focus, a contrast to the soft, fluffy clouds. Smilde likes that his creations last but a moment. If he could figure out the technical aspects, Smilde would like to create clouds within the vast Turbine Hall at the Tate Modern. Marketers from cloud computing companies in Silicon Valley have approached him to make sculptures at conventions, but he’s declined. For him, it’s more than a parlor trick.